In a medium sauce pan, bring to the boil water quinoa and salt. Once it is bubbling reduce the flame to medium low, cover the pan, and simmer until the quinoa is tender (approximately 20-25 minutes). Take care not to burn the quinoa as the water will evaporate in this time (if there is water left, pour it through a sieve to drain the water). 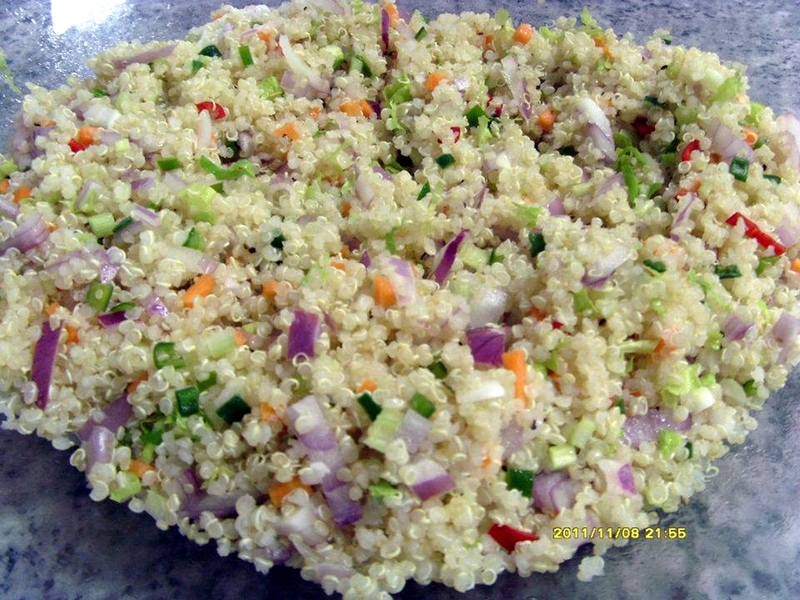 Transfer the quinoa it into large mixing bowl and allow to cool for about 10 minutes. Meanwhile in a separate bowl mix together the oil, vinegar, lemon juice and cayenne pepper to make the salad dressing. Once the quinoa is cool, pour the sauce/dressing into the bowl of quinoa, add the green onion, raisins, and cilantro/flat leaves parsley. Add the pecan nuts just before serving. Serves 6 for a starter or 3 for a meal.